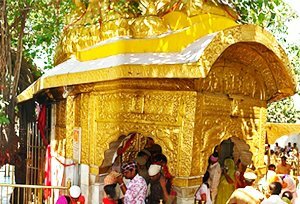 Chintpurni is a major idolized shrine of the Hindus, which is located in the Una district of Himachal Pradesh. It is placed on one of the highest peaks of the Sola Singhi Range. Chintpurni Devi is the goddess here who takes away all the worries and stress of devotees. In this temple, the Goddess is showed without her head in a pindi form (round stone). Many Devotees have been flocking Shaktipeeth for centuries to worship at the lotus feet of Mata Shri Chhinnamastika Devi. Over and above, the place is having beautiful surroundings. Wandering in and around the temple, tourists may indulge in sightseeing and other indoor & outdoor activities as there are some beautiful places that offer plenty of picturesque views. Chintpurni Temple "A Shakti Peeth" The Chinna Mastika Devi is a divine avatar of self-sacrifice and so the Chintpurni Shri is known as a Shakti Peeth. As per the legend, at the time of self sacrifice a part of Sati's feet fell at the place and then later on the temple was built there. Another legend says that Goddess appeared to bump off two demons Sumbha and Nishumbha. After killing the demons, the friend of Goddess who accompanied her ask for more blood and then she cut her head to assuage her thirst of blood. Bhai Mai Das was a keen devotee of Goddess Durga. Once upon a time, the Goddess came in his dream and asked him to build a temple at this place. So, keeping the instruction of god in mind, he built the temple in Chhaproh village. Since then, his descendants started doing the worship of Shri Chintpurni. His descendants are now the official priests of this temple. 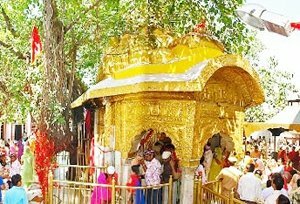 Fairs and Festivals During Navratras, the temple observes big fairs and festivity in which a large number of people from all across the world flock this place to take the blessings from the Goddess. The fair is held near the temple of Goddess Bhagwati Chhinmastaka where the mother Goddess appeared in stellar form during ancient times.